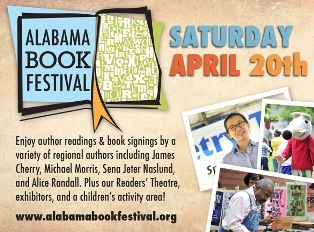 in Montgomery, April 20, in Old Alabama Town. During the daylong festival the authors will read excerpts, answer questions, and be on hand to sign books. The festival concludes with the Alabama Readers Theatre performing Now Is the Time for All Good Men, a play by Harper Lee. A list of all the authors, brief biographies, schedules, and other information is posted on the ABF website. Among the writers coming this year is Therese Anne Fowler, recently interviewed on National Public Radio concerning her new book, Z: A Novel of Zelda Fitzgerald. Her fictional account of the life of the famous Montgomery native is a Best Pick for 2013 by Huffington Post. Birmingham native and New York Times bestselling author Sena Jeter Naslund is author of Ahab’s Wife.” Adam and Eve is her latest book. James Cherry, Still a Man and Other Stories, was nominated for a NAACP Image Award in 2009 for his poetry collection Honoring the Ancestors. A native of Jackson, Tennessee, he was nominated for a Lillian Smith Book Award. In the nonfiction arena, several of the books are food-related. “Since 2013 has been designated the Year of Alabama Food by the Alabama Tourism Department, we wanted to do something in keeping with that theme,” said Gail Waller, one of the festival organizers. Among the books chosen are Tasia’s Table: Cooking with the Artisan Cheesemaker at Belle Chevre by Tasia Malakasis, Barbecue: The History of an American Institution by Robert Moss, Southern Living Off the Eaten Path: Favorite Southern Dives and 150 Recipes That Made Them Famous by Morgan Murphy, and The Ploy of Cooking by the Mystic Order of East Alabama Fiction Writers. Among the other eleven nonfiction writers is Peggy Allen, a Greenville, Ala., native who has written a memoir titled The Pecan Orchard about growing up in the segregated South. Dr. Frank “Doc” Adams, musician, teacher, Alabama Jazz Hall of Fame Inductee and inspiration to generations of young musicians, is the subject of Doc: The Story of a Birmingham Jazz Man by Burgin Mathews and Frank Adams. The former commander of Maxwell Air Force Base is the subject of the biography by Warren A. Trest, Once a Fighter Pilot: The Story of Lt. Gen. Charles G. ‘Chick’ Cleveland. More than two dozen women give glimpses of their lives in What My Mother Gave Me: Thirty-one Women on the Gifts that Mattered Most. Montgomery native Judith Hillman Paterson is one of the contributors. This Is Not a Drill by Beck McDowell of Huntsville is one of two books in the Young Adult Fiction genre. It is about two teens trying to save a class of first-graders from a gun-wielding soldier suffering from PTSD. Author Jennifer Echols, Such a Rush, has written nine romantic novels for young adults and won numerous awards including the National Readers’ Choice Award. She grew up in Alexander City on Lake Martin, which serves as the setting for many of her novels. She now lives in Birmingham. Children’s books are represented by two pairs of mother-daughter writing teams. Kerry Madden and Lucy Madden-Lunsford have produced a beautifully-illustrated children’s book, Nothing Fancy About Kathryn and Charlie, based on the friendship between Alabama artist Charlie Lucas and Alabama storyteller Kathryn Tucker Windham. Alice Randall and Caroline Randall Williams were nominated for an NAACP Image Award for their children’s book, The Diary of B.B. Bright Possible Princess. Alice Randall is theNew York Times bestselling author of The Wind Done Gone. A graduate of Harvard University, Randall now resides in Nashville, where she is a songwriter and Writer-in-Residence at Vanderbilt University. Caroline Randall Williams is a graduate of Harvard University. She was an instructor with Teach for America for two years and is currently pursuing her MFA at the University of Mississippi. The Diary of B. B. Bright, Possible Princess is her first book. Eight writers are represented in the poetry genre—Mitchell Douglas, Jeremy Downes, Andrew Glaze, Juliana Gray, Derrick Harriell, Carolyn Hembree, Lita Hooper, and Barry Marks. Douglas’ Cooling Board: A Long-Playing Poem on the life of singer Donny Hathaway, was nominated for an NAACP Image Award in the Outstanding Literary Work-Poetry category and a Hurston/Wright Legacy Award. Andrew Glaze was named Poet Laureate of Alabama in November. He has written nine books of poetry, the first of which, Damned Ugly Children, was chosen by the American Library Association as a Notable Book of 1966. He has won numerous awards over his long career. His most recent book is Greatest Hits 1964-2004. Festival grounds open at 9 a.m. Hours for the festival are 10 a.m. - 4 p.m., with the Readers Theatre 4-4:45 p.m. The festival is free and open to the public. Capitol Book and News will be on the premises for purchase of the authors’ books.